If this is your attitude towards web forms that capture valuable user information, then you’re gonna lose in the conversion rate optimization game – and that means you’re gonna lose dollars. If losing dollars doesn’t matter to you, then feel free to skip this read. However, if you want to squeeze every bit of ROI out of your digital advertising dollars, then I suggest you continue to read this guide. 1. Why Worry About Web Forms? Quite simply, the web form is the bridge connecting you to potential users. This is how they contact you. If it is hard to contact you, they will contact you less, and you will lose out on leads and money. However, if you can improve how easy it is for users to contact you, then you will increase the rate at which users fill out your form, gain leads, and therefore gain money. This is why you want to work on improving your web form performance. In order for users to want to give you their information, you have to give them something that is valuable to them. This is a pretty basic principle of bartering that has existed since the beginning of our species. You could say that this instinct to want something in return for something we give is innate. Therefore, it makes a lot of sense to let users who arrive to your landing page know immediately what they are getting from you. If you’ve done your job well, users should already have an idea of the benefit you’re offering, because ad copy best practices tell an experienced advertiser or advertising agency to make it clear what the benefit is from the start, directly within the ad itself. 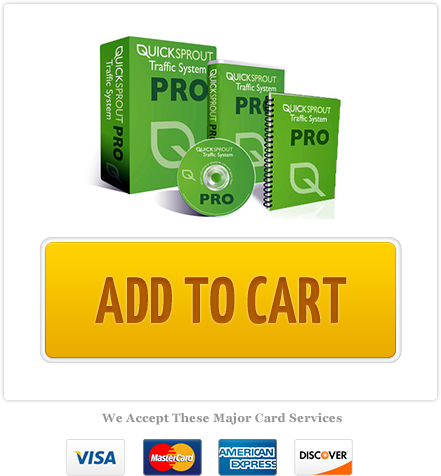 Once you get to the landing page, it is imperative that you reiterate the value proposition. Listing, numbering, and bullet points are easy and user-friendly ways to present your benefits. An overlooked aspect of the conversion rate optimization process for form fills is the outcome. 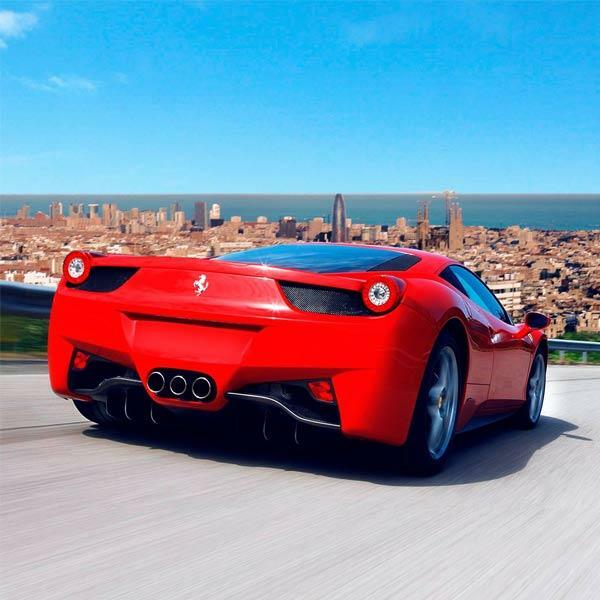 You probably won’t be able to come up with an offer as tantalizing as a free Ferrari, but you can probably get closer to something of more value than you already have. Make the outcome genuinely valuable, and express that value explicitly – whether on the button, in the headline, or in the benefits – and then back it up. Give your users knowledge or benefits that actually help them. Sounds crazy, I know. Fear Of Missing Out is a very real modern phenomenon. There are so many exciting things in the world, and I-want-my-cake-and-eat-it-too humans want it all. Capitalize on this fear by incorporating the participation of the masses into your messaging. Many advertising platforms today lull publishers into complacency with simple and uninspiring CTA buttons: Submit Now, Learn More, and Buy Now. Publishers should snap out of this complacency if they want to improve their conversion rates. Of course, creating a perfect CTA isn’t realistic. But striving for greatness, as the great NBA player LeBron James might say, should be mandatory. That’s also why we have A/B testing; as advertisers, we should always be in search of an incremental improvement in all aspects of our digital marketing campaigns – including the all important call-to-action button. Anyway, back to striving for the perfect CTA. 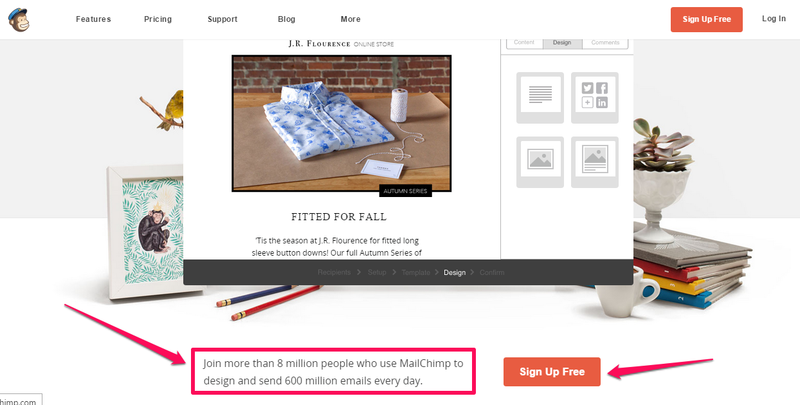 One of the best ways to get users to convert is to offer them a free sample. This is why, when you’re strolling through the mall, you constantly have sellers trying to get you to try out their product. This isn’t just a played out old trick; the reason you see this tactic so much is because it works. 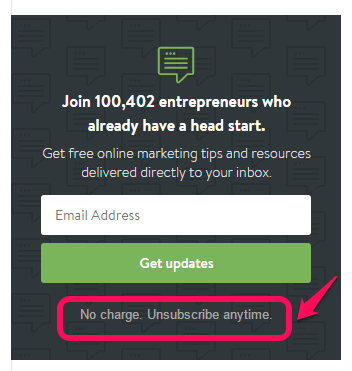 If you’re a B2B business, a limited free subscription or a free trial gets your users halfway there. Many times, it’s just a matter of who gets to the customer first, and a free trial is an easy way to accomplish this. If you have a great product, and you get visitors to start using it, then you can already see the finish line. 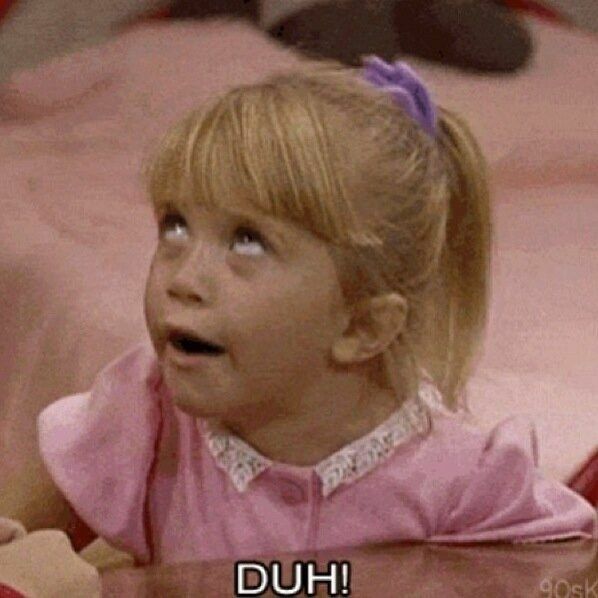 Have you ever signed up for a free trial, knowing that you were going to cancel, but then got too lazy and never cancelled it? It has happened to all of us, and that’s how they get you, and that’s how you can get users! Don’t overthink it, the free trial is tried and tested. And you’re not just ‘getting them’, you’re providing them with a product that’s too helpful to stop using. Another best practice is just to follow through on your CTAs. 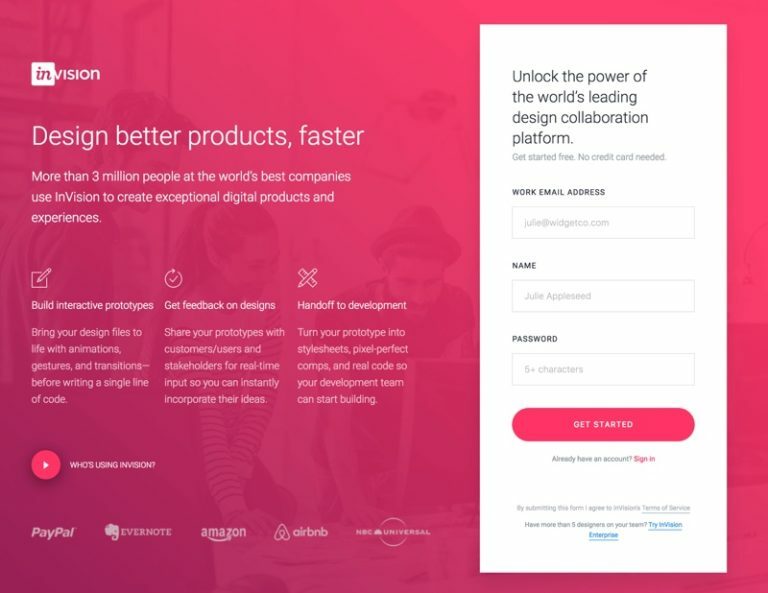 If you say the user will get something in your ad, don’t get fancy, just reiterate the same message on your landing page, and you’ll already be ahead of the curve. Don’t confuse the user with different wording or links to do different things. The fancy term for it is symmetry. Point a user’s eye to the CTA. One method is to literally point to the form or CTA. Users can be easily influenced by subtle directional cues. This might seem too obvious or inconsequential, but studies show a lift in conversion rates with these basic methods. If you’re reading this article, then you have probably heard of form field optimization. And if you’ve heard of it, then you’ve inevitably come across the concept of reducing the number of fields in your form. 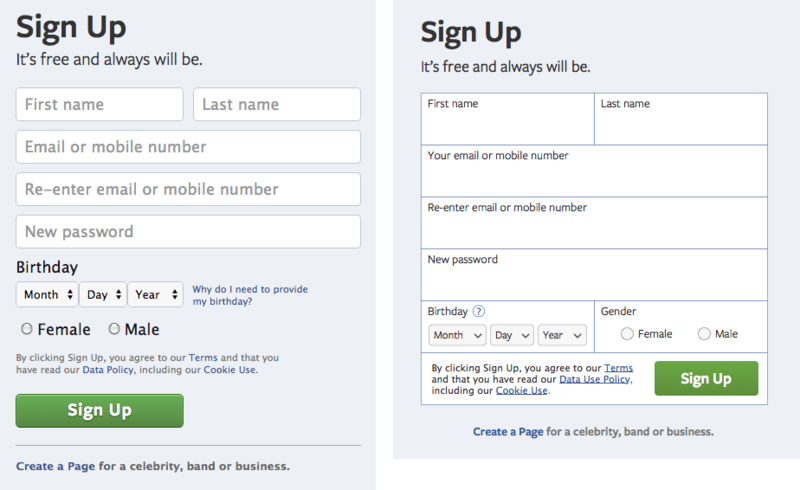 Reducing the number of fields can help increase conversion rate because there’s a lower barrier to completing the form. For example, use single input entries whenever you can. Reduce the friction, or the natural inclination not to complete a form. Obviously the number of fields the user has to submit can increase friction as the number increases, and vice versa. However, the importance of each field towards closing a sale is also relevant. In your test revenue analysis, take into account fields like phone number or address that help your salespeople follow-up and directly lead to closing sales. When optimizing for number of fields, you don’t just take into consideration the effect of filling out the field, but also the value that field brings. If the field is the most important field, then leaving it out may reduce friction and allow the user to complete the form, but the form could be, say, 50% less effective in closing a sale. That matters. Many businesses try to learn too much about their potential leads before they even become leads. This is greedy. What possible information could you get early on that could be worth putting a long answer field on your form? Even if you make this form field optional, the open-ended box can create friction with the user that can be hard to overcome. They’ll look at that long box and not know what to say, and abandon the form. You can test forms with different fields by hiding certain fields from certain forms and seeing how that form does. This method of hiding fields also helps to prevent errors from happening when a field is not submitted. You can easily adjust the fields with a few quick presses of a button. Try different combinations of fields based on your business model, and find the combination that works best for your business in terms of necessary fields that make the lead as valuable as possible – while also making the completion rate as high as possible. Breaking up your form into multiple steps has been the rage for a while, and is starting to become more and more mainstream. There are countless studies that show that breaking up the web form submission process into different parts leads to crazy percentage increases in conversions. 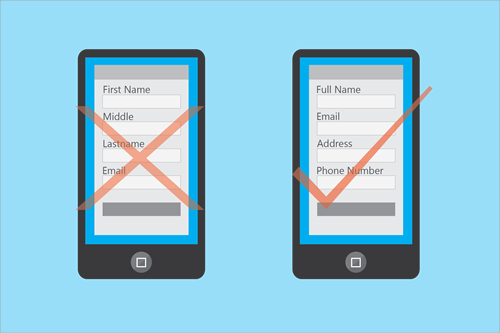 There are a few psychological reasons why breaking up the form fill process reduces user friction to completing a form. For one, the first impression is less overwhelming. “Oh, I only have to fill out or answer this one question first, easy,” a user might say. The progress bars also encourage users to continue. The process is almost gamified. The user actually wants to finish to get the bar all the way to the end. You can also ask the worst questions at the end. Once a user is invested, the last step seems like less of a hurdle. Indeed, this is one of the best practices of breaking down the form fill into multiple steps: ask the easiest questions or obtain the least valuable information first. Hit them with the hard questions, or the fields that have the highest barrier to form completion, at the end. The illusion of progress impels us to finish, as one experiment has shown. 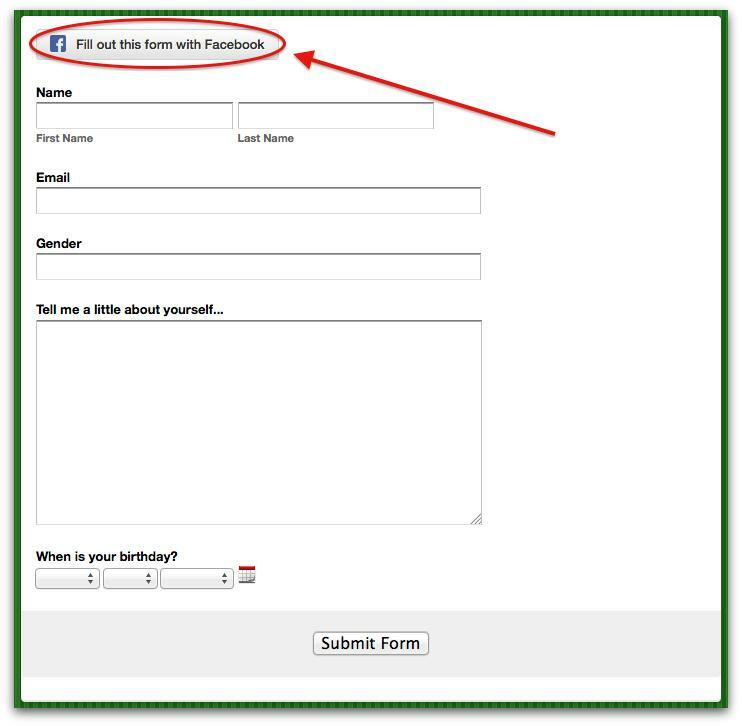 Related to page distribution of your form, use conditional logic in your questions to personalize the form filling experience. This will make the user feel even more invested in the form filling process. Conditional logic is when a user’s answer affects the following question he or she receives. In some cases, the user will feel that these easy questions are helping you to deliver an even more beneficial result for them, so once they reach the end of a page distributed form and you ask them the hard questions, they’ll be even less likely to abandon the form. You can also end the form on a personalized note that distinguishes who they are based on the answers to their questions. A personalized touch at the end of the form can be just the push that a user needs to clear the last hurdle and click ‘Submit’. Test different aspects of the button outside of the text (we’ll get to this). These factors can make a difference, even if they are only subtle changes. Get creative. Try really big buttons, sharp corners, rounded corners, etc. One business added a picture of their product on top of the button and saw great results. You never know what’s going to work. Various studies have been done on the best converting button color, but every business is different, so you’ll want to do your own research to see what works best for you. The big thing you want to accomplish with high contrasting buttons is to have them stand out. A more salient button will improve the chances that the user clicks it. Words can make all the difference in the world. Take ‘Get Free Ebook’ as opposed to ‘Download Now’. Both CTAs are decent and could generate high conversion rates, but again, you won’t know for your particular business or business model until you test each. Maybe the ‘free’ aspect of the CTA works best, or maybe the immediacy of getting something ‘now’ is more important to your audience. Humans react to different words in varying ways, and you’ll want to gain the edge in wording by testing as many versions as you can. Keep your button copy short. Short button copy simply looks and works better. The text also needs to match up with the CTA you’ve been advertising since before the user got to the landing page. Set the right expectations for the landing page and follow through. For example, if you say ‘Get a Free Demo Now’ on your ad copy, and on the landing page, the user sees a button to click to ‘Get Free Pricing Information’, the user’s expectations are not met, and there’s a good chance he or she will bounce. Use action verbs that indicate something exciting is about to happen. The CTA button copy is the KO – as Neil Patel likes to say – but I like the 100 meter dash as an analogy better. This is the equivalent of finishing strong in the race. The user has come this far and has entered in their information; all they have to do now is click the button. Even though you know you’re probably going to finish the race in 1st place, you want to make sure. Make like Usain Bolt and finish strong! This image speaks to the savviness of internet users today. 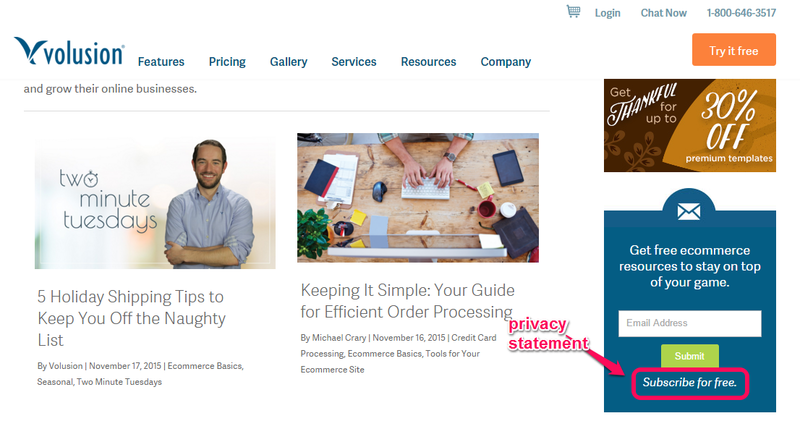 While instinctively, a privacy statement should increase conversions, proffering too much information or insinuating that your data will be used for something close to spamming can work against you. Sometimes, you might even be promising less in terms of privacy, but if you state it simply, users are more apt to either gloss over it or trust you because you’re coming off as completely honest. Volusion’s statement here doesn’t really say much, but the creativity and the matter-of-factness can help users overcome their distrust of a privacy statement that won’t deliver on what it says. At least this one is 100% true. Long story short, be honest, but include some kind of statement that represents how you will use their information. 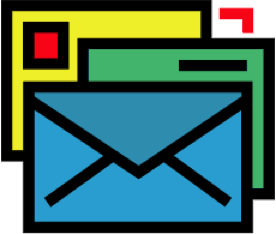 Send a personalized confirmation email to the submitter, because it is important to follow-up with your lead as soon as you can – which also helps with qualification. Pass data in an organized and automated way to the people who need it. Companies like Zapier can help you with CRM integrations and other ways to maximize the use of forms in your company. Up until this point, we’ve been discussing more defensive moves in terms of limiting barriers to get the user to submit their information. This is an offensive move. If you need to have a form to acquire user information, you might as well make the most of it and use it for other purposes if you can. Fields that are invisible to the user, but are able to pass along useful information for your company, can be extremely useful. 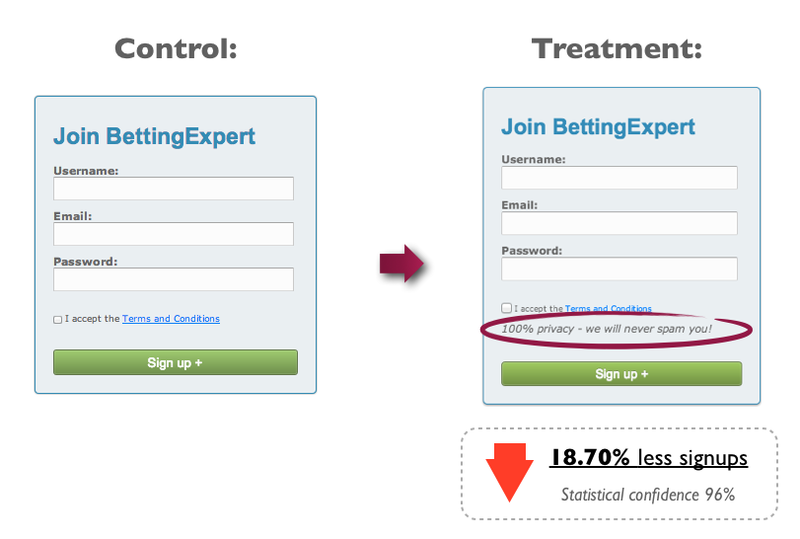 If you’re running an A/B landing page test, you can include a hidden form to mark certain attributes you’re testing. You can also do this if you create specific landing pages for certain ads to do ad copy testing tracked to the revenue level. 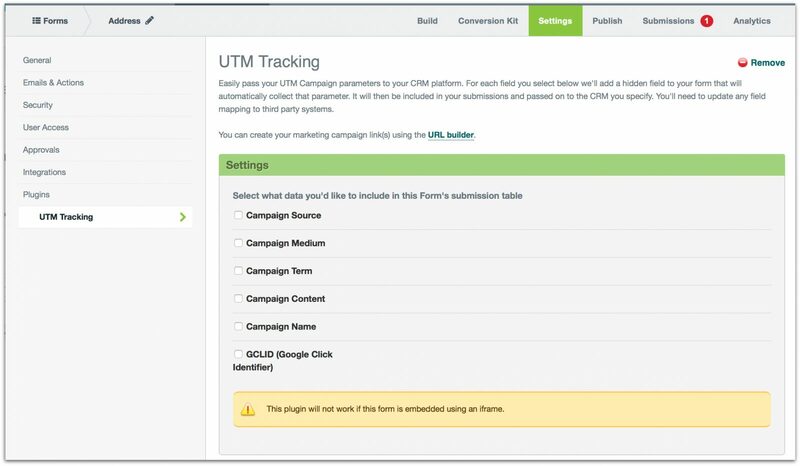 You can use this to pass campaign data – which makes it easier to track, for example, your pay-per-click advertising efforts. 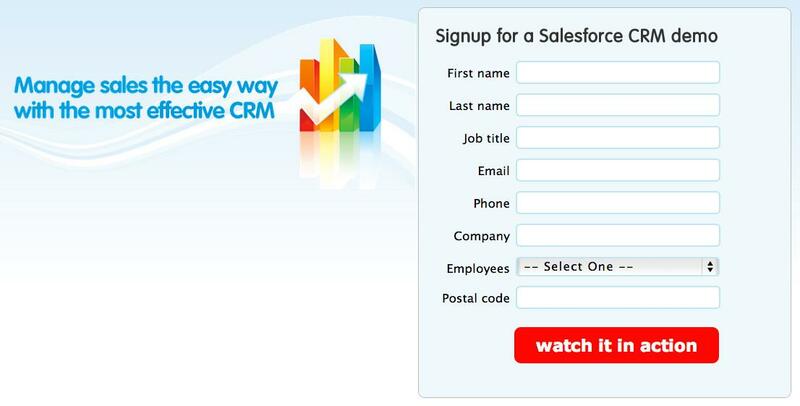 You can pass the data to the CRM that is linked. You can then pull back-end reports to see how that lead turned out and include the ppc campaign data too. Here is an example of hidden forms in action through a third-party form vendor. One way to do this is to use the form to track PPC campaign information, instead using cumbersome URL tracking parameters appended to destination URLs. This is especially useful when you collect leads in a CRM and it’s difficult to see how the leads turn out. When you can track the progress or results of leads, you gain the ability to attribute revenue (or lack thereof) to campaigns – which is the ultimate metric in measuring the success of your advertising efforts. More and more, forms are taking advantage of auto-fill, using the information of tech giants where everyone has an account – namely Google and Facebook. Formstack is one company that allows you to add this to your forms. 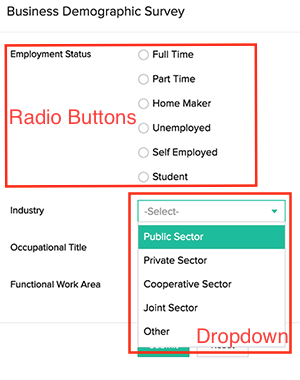 With this option, you don’t have to worry about the friction added by fields and other tedious form fill barriers we’ve discussed. By now, you’re probably tired of hearing that over half of internet users do everything on their mobile devices, and that in a short amount of time, internet usage will be dominated by mobile phones. You’re also probably sick of hearing that you need to adjust to this now or all of your digital marketing efforts will be doomed. It’s so true, and you’ve been there. Users probably won’t power through the ‘zooming in’ problem in this day and age. We can be better, and if you’re not optimizing the experience for mobile users, you will lose money. Test your form on all devices, if you can. Sometimes this is simply not possible. At the very least, see what devices are used by a majority of your users and make sure that your form looks great on these devices. Have a mobile version of images, because scrolling from bigger images can be annoying – and anything annoying can decrease your conversion rate. In general, if you don’t want to have to adjust your landing page from desktop to mobile too much, then just use small images across the board. This not only cuts down on the scrolling factor, but smaller pages load faster, which helps with overall loading speed. 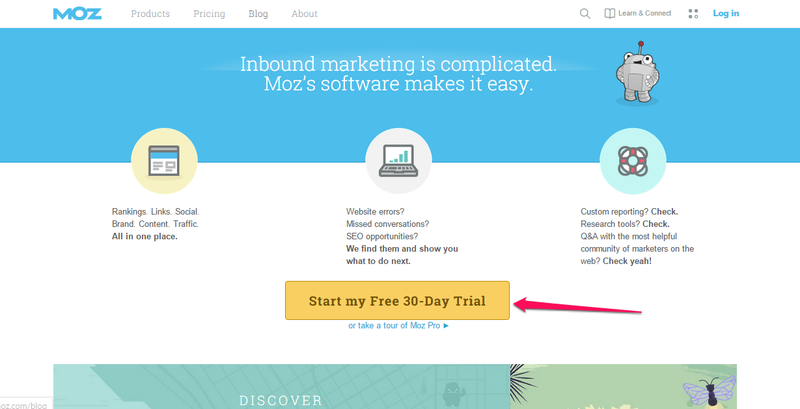 Many best practice guides recommend that you place all calls-to-action above the fold, but expert Neil Patel found through experimentation that placing the button right below the fold gives the user time to read a bit before converting. 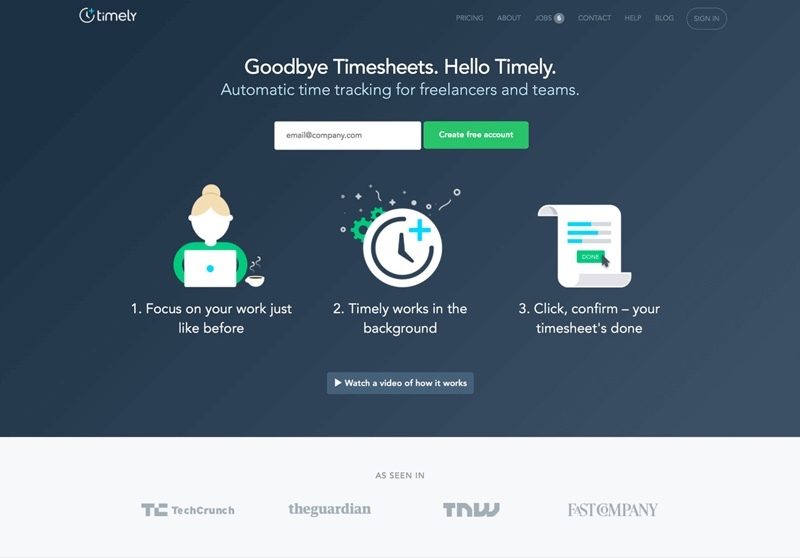 You’ll want to experiment with the locations of the form and the CTA button. More importantly, you want to give the user enough information, but as concisely as possible, to make them want to push that CTA button. How do you know when – or if – to use any of these form fill elements? There is no consensus on how or when to use these different aspects for capturing information. In some instances they work great; in others, they can be cumbersome for the user. As always, spend some time testing various options for different fields yourself. Each audience can be different and your business is unique, so use other experiment results for guidance, but also replicate and validate results on your own. If you have 2-6 options, use radio buttons. If you have 7-15 options, use a dropdown list. If you have 16+ options, use an auto-fill field. Using infield, top aligned labels can help limit whitespace between fields, which can slow down scanning. Compare the difference between top aligned, top aligned with infield labels, and infield/top-aligned labels to see the difference these changes can make in scanning (it becomes easier), in encouraging form fills (customers are more likely to fill), and ultimately, in conversion rate (hint: conversion rates change upwards!). As you can see, having both top aligned AND infield labels makes the screen look cleaner, less intimidating, and increases the chances that a user will complete the form, thus increasing conversion rate. You might not have noticed how the keyboard appears on your mobile device; if this is the case, then maybe you’ve been lucky in the forms you’ve encountered. Try using tappable solutions as they may or may not increase efficiency. You won’t know until you try. As you can see, there are countless ways to optimize a web form. Some of the aspects – like the button, the CTA, or the distribution of the web form – could be analyzed in greater detail with their own respective blog posts. 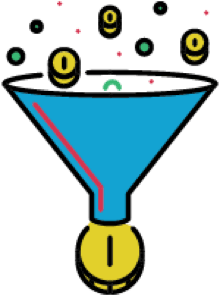 If you’ve got a bunch of PPC campaigns across many platforms working well, the form fill optimization can be the rising tide that lifts all the boats. Don’t neglect this aspect of your PPC efforts if you want to rake in the digital marketing ROI dough!